We have retained our new Great Barr location. Thank you for all for your positive comments about the venue. 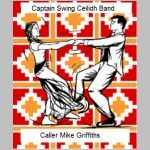 Once again we have Captain Swing to provide our festive fun with Mike Griffiths calling and keeping us all on our toes (In my case other people’s toes) As we sell out every year this is your early warning to order your tickets.